Birthday parties are the best moments of being a kid and it has its own staples: balloons, pizzas, cakes, ice cream, and a clown. But birthday parties need not be limited to just munching the cupcakes or laughing at the clown’s antics. 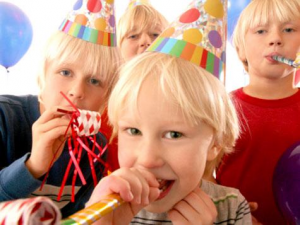 Add these age-appropriate games to your son’s next birthday party and you will see the kids more involved and have ten times more fun. Group the kids into two and have each group form a line. 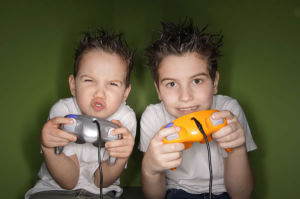 The number of members per group can vary (like 5-15 kids in each group), the more kids, the funnier the game. 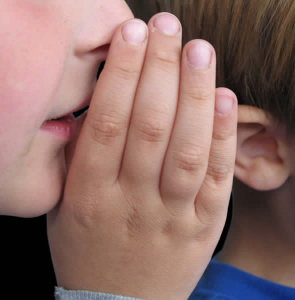 Give a message, like a statement, or an idea to the first kid on each line. And have them whisper the message as it is to the next kid, until it reaches the end of the line. The group with the closest one to the original message wins. A variation is to have the first kid in line read the message and have the last kid in line write it again on a white board with a marker. 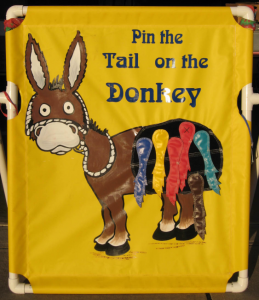 This works similar to Pin the Tail on the Donkey game, but you can try other ideas, like pinning the Soccer Ball on the Goal, or the Nose to the Clown, or even pin the Hammer on Thor’s hands. Play in groups or individually. Blindfold the kid and spin him. Have him pin the object on the illustration (with the cork board under it). 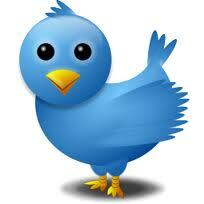 Have hours of fun and laughter. Fill the inflatable pool or tub with water and place the pails on the far end. Create two groups where each group has 5-10 kids. Have the group line up on each side of the tub or pool. 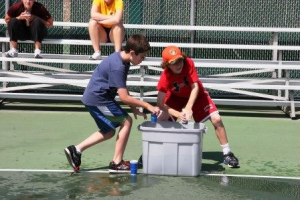 Each kid in the line will get water from the pool with a cup and carry it to the pail. There should only be one cup or spoon per group. The group with most water in their pail wins. 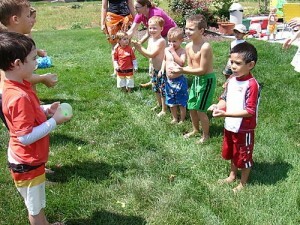 A variation of the Water Relay Game, but this party game is more challenging. 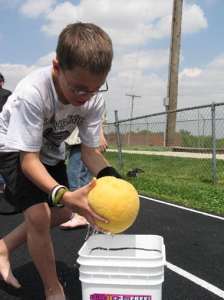 Instead of using cups, kids will use sponges to absorb water from the pool and squeezing it to the pail. The spillages and squeezing part will add more delay to the race, offering more obstacles. This birthday party game brings out teamwork, competiveness, creativity, and the math genius (who knows) among the kids. 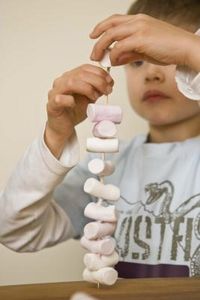 Group them into groups and hand each group a bag of marshmallows and a box of toothpicks. Have each group build the highest (and structurally stable) marshmallow tower within a limited amount of time (like three of five minutes). And be amazed how the kids will use their imagination to complete the task. For additional challenge, you can use uncooked pasta instead of toothpicks (since they break off more easily). For this game, group the kids into two; have them line up facing each other (with around a distance of 4-5 feet). Hand one side a water balloon each. At a signal (like a whistle), each member of the group faces his opponent and throws the balloon to him without breaking it. You can increase the distance with each round. The group with the most un-popped balloons wins. You can add more fun by using colored water. Just be sure the coloring is water-based and easy to remove. This will definitely bring the competitiveness out of each kid. Hold a Video Game Tournament using just one game. A fighting game, racing game, or (for more fun) a dancing game are the best choices. Let them face off with each other until one player ultimately wins. Set a big prize for the winner, or even just bragging rights will do.